At Fisherman’s Wharf, in San Francisco, what brings in the crowds are crabs. There’s the Crab House. Crab Station. Crab Shack. Larry “Duck” Collins is president of the San Francisco Crab Boat Owners Association, based at the wharf. But even though he makes his living, or part of it, fishing crab, that’s not because he likes doing it. Crabbing, he says, is like factory work. Pull up the traps, empty them out, drop them back down. Salmon? Now that’s real fishing. This year, Collins is poised to do more salmon fishing than he’s done in years. Biologists say more than 800,000 Sacramento chinook are off the coast right now. It’s the biggest number they’ve seen since 2005. As a result, the Pacific Fishery Management Council, which sets guidelines for commercial and sport fisheries, announced earlier this month that it’s considering three options for a 2012 salmon season, all of which would give anglers a chance to catch more fish than they have in years. The final decision will be announced in early April. The last few years have been brutal for commercial fishermen. Salmon is a $1.2 billion business in California, but habitat loss, water diversions, and pollution have taken their toll. Salmon populations dropped so low that no fishing was allowed in 2008 and 2009. For the last couple of years, salmon fishermen were allowed back onto the ocean for limited seasons. Great news, but will it last? Given the big 2012 projections, it would seem that nature is on the mend, right? Well, not if you ask Jacob Katz, who studies salmon biology at UC Davis. Katz means this almost literally. He says one big reason there are so many returning salmon is that we humans have been producing tens of millions of the baby fish in breeding facilities called hatcheries. These aren’t GMO fish or farmed fish. They swim out to sea, grow in the ocean, return to spawn and are sold as wild salmon. California’s salmon hatcheries date back more than a hundred years and actually began as an attempt to transplant chinook to East Coast streams to save declining fisheries there (it didn’t work). Later, dams on rivers up and down the Central Valley made it impossible for chinook to get to their spawning grounds, and the hatcheries were put to work maintaining native salmon runs. Adult salmon were artificially spawned, then young salmon were raised in tanks and released into rivers below the dams so they could migrate safely to the ocean. But over time, researchers started noticing something else: In some parts of the state, hatchery fish had nearly replaced the native fish. 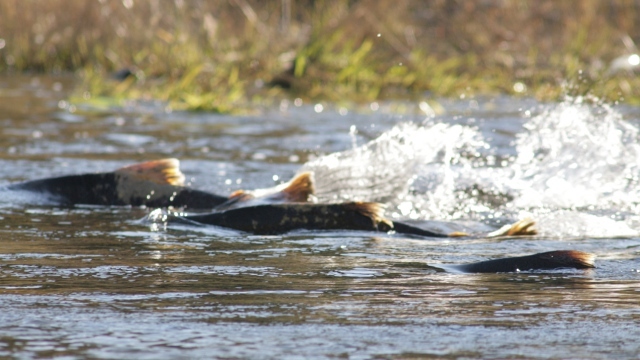 A study released earlier this year found that only ten percent of the fall-run chinook salmon spawning in California’s Mokelumne River had spawned naturally. “The fact that you can sometimes make a lot of fish in a bucket has masked the fact that we’ve almost completely driven our wild fish to extinction,” he says. Why the Boom and Bust? The question you should be asking now is this: If hatcheries have been around for a century, why are we seeing this sudden influx of fish? The short answer is: No one knows. It could have to do with good ocean conditions, or the fact that there was more rain in 2011, and a decrease in water diversions. But some biologists, including Katz, say the influx has everything to do with the hatchery system. Because they’re produced from a smaller stock, hatchery fish lack genetic diversity. They can’t adapt quickly. So, when ocean conditions are good – with cooler temperatures and good upwelling, like last year — the fish thrive. But the pendulum can easily swing the other way. Which brings us back to Larry Collins. I ask Collins whether, if the salmon disappear again, he too could be forced to take a land job. He looks at me like I’ve just sprouted fins. He’s been fishing for 29 years. There’s no going back. Salmon season is expected to start in April and wrap up around October or November. Experts only know enough to make a decision based on a few premises. Nature has evolved to make a species survive by creating diversity through gene mutations. No shortcuts will save us. We need to tear down dams that are only going to silt over time anyway and let native species adapt. The smartest people in the room can’t think of everything.